Residents of Umuobia Housing Estate in Olokoro, Umuahia South Local Government Area of Abia State were shocked yesterday when bodies of a pastor, his assistant and women leader were removed from the cleric’s residence by operatives of the State Criminal Investigation and Intelligence Department (SCIID). The pastor is identified as Blessed Kelechukwu. The decomposing bodies were discovered a week after they were believed to have been murdered by assailants who are yet to be traced. Some of the relatives and church members said at the scene of the incident that the assailants must have attacked the victims last Sunday morning as the two pastors were not in church last Sunday. They added that they discovered that the deceased were dead on Friday evening when they visited Pastor Kelechi’s house and saw the bodies. The Deputy Commissioner of Police (DCP) in charge of the SCIID, Patrick Edung, who led the police operatives to evacuate the bodies, said the police had commenced investigation into the matter. He added that some relatives of the deceased reported the incident to the police which made them to come for the evacuation. 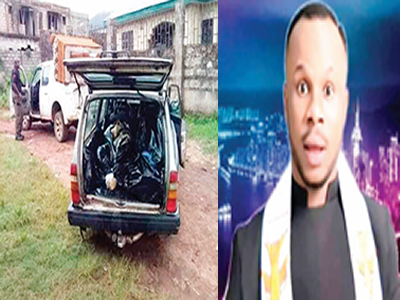 Edung explained that the deceased was the pastor of Winds of Glory Church, a new generation church located at Ohokobe village in Umuahia North Local Government Area. The DCP also confirmed that in the pastor’s residence were the decomposing bodies of his Assistance pastor, Ambassador Kalu Ikeagwu, and a woman, Ruth Andrew, said to be the church’s women leader. He said the bodies had been deposited at the mortuary.